Island Restaurant offers the finest cuisine in modern surroundings with attentive, efficient, and friendly service. Sample the delights of cosmopolitan food, freshly prepared using the best ingredients with plenty of fresh herbs and spices. 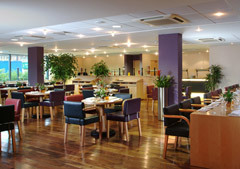 The restaurant is part of the Holiday Inn Brentford Lock built next to the Grand Union Canal in the heart of Brentford. The restaurant is open all day, although the signature dishes are only available for lunch or dinner. The rest of the day you can order a snack or light meal whilst relaxing in the comfortable surroundings of the Island restaurant and enjoying the beautiful view of the canal. This restaurant is the perfect venue for all types of events and celebrations with dedicated staff to help organising the occasion. The restaurant has three private rooms and can hold a large party of 500 people in its waterfront suite. Waterfront 1 is suitable for parties of up to 150 people whilst smaller parties of up to 30 people can hire the waterfront 4. Being part of a grand establishment the restaurant is well equipped to host all types of conferences with all private rooms fully equipped with audio/visual and modern communications facilities. Traditional family lunch every sunday. �9.95 per person. The menu offers European, Asian and Classic dishes as well as healthy options such as whole troat marinated in whole-grain mustard and roasted in a tandoor. Island offers an extensive wine list to ensure that its selection of wines always complement the cuisines in the menu. Essays like this are so important to brideanong people's horizons.